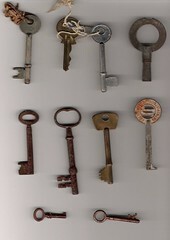 A selection of keys I found in the pantry whilst spring cleaning. Some of the keys were hanging on the hooks when we bought the house, but I have yet to find anything they would open. Others have been added on the 8 years we have lived here. Ones from boot fairs and the bottom of handbags. The most unusual one has the words. "Furniture super suite" stamped on it. One was from our old house in Lambeth Walk, from the dead lock.